As a customer of byRemote's Off-Site Hosting video storage products, your video is stored at a remote secure data center facility. 24 x 7 building security monitoring, video surveillance monitoring and recording and engineering response. 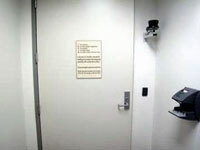 "Mantrap entry" with key card and biometric access authentication. Access logging on all key card doors. Segmented co-location and main server rooms. Closed wiring conduits for all wire and fiber outside of the server room and within the co-location room. State-of-the-art facilities in the AAA-rated building. Dual electrical grid connections from independent substations. Internally redundant, by-passable 250 KVA UPS systems. Fault tolerant 600V air conditioning system with humidity regulation. Air conditioning units and pumps connected to generator power for unlimited run time in the event of a utility power failure. Stratified air flow design for increased cooling efficiency and reduced energy costs. Non-service-affecting FM-200(r) Fire Suppression System with multiple zones, central control and connectivity to the building fire system. Multiple GigEback-bone trunks for fast network performance and traffic spike tolerance. 24 X 7 network monitoring and response. Multiple, fault-tolerant upstream fiber connections. Burstable and un-capped bandwidth for each server connection with a minimum speed of 100 Mbps. Internal (non-Internet) bandwidth traffic is not metered. Connections to mutiple Tier-1 bandwidth providers. 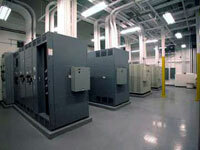 12 data center locations in North America, Australia, Asia and Europe. Fully redundant core switches, routers and load balancers. Uses 802.1 rapid spanning tree protocol (RSTP) for instant fail-over. Dedicated backup generator with manual bypass to second non-dedicated backup generator in the event of a generator failure. Infratructure built to comply with seismic code. 24 X 7 administrative access and support. 24 X 7 on-line support ticket submission and response. Expertise with multiple server configurations (VPN, load balancing, Firewalls). Custom network monitoring with user-configurable notifications. 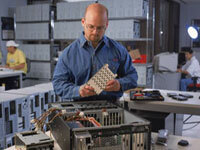 100% up-time guarantee with 1-hour component replacement.